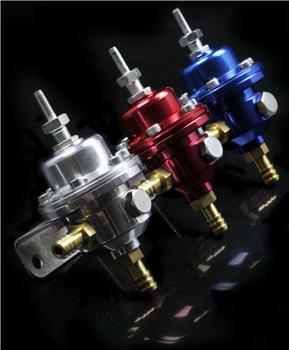 Weapon-R has developed a compact sized fully adjustable fuel pressure regulator, for high performance racing vehicles. Fully CNC machined construction from 6061 billet aluminum. Weapon-R adjustable fuel pressure regulators have threaded ports, which allows you to tailor the fuel regulator output to any configuration and is capable of supplying fuel to engines in excess of 800 horsepower. Our fuel rail adapters eliminate the OEM regulator for higher flow of fuel to the adjustable fuel pressure regulator.